3. It broadens singer’s understanding of sound, pitch, and timbre. For children, these experiences can help shape their understanding of what a trumpet sounds like or how high a flute can play, or how soft a violin can play. In addition to enhancing your choir’s music-making experience and increasing engagement, incorporating instruments also gives you valuable teaching moments in your rehearsals: an opportunity to talk about high vs. low sounds, tone, phrasing, and other elements of musical expression. You know the benefits of including instruments in your rehearsals from time to time, but practically-speaking, what does this look like? What if the new anthems you have picked out for this year don’t include instrumental parts? 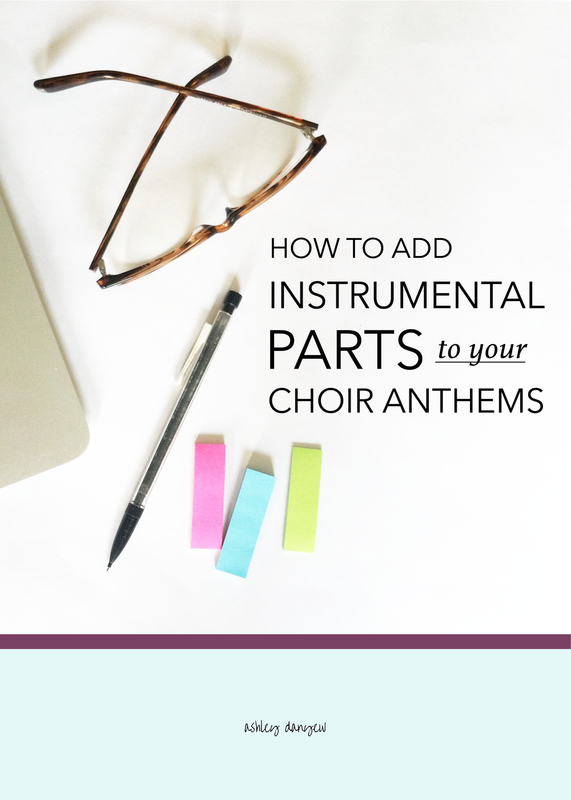 Today, I’m going to walk you through writing your own instrumental part to add to a choir anthem. Hand-clapping: a simple way to incorporate movement and rhythmic interest during the introduction and any interludes that might occur. Before we go into specifics on how to write new parts and create your own arrangement, let’s talk about copyright. Adding something new to an existing piece is called creating a derivative work, or an arrangement. If the work is under copyright, you need permission to arrange it. If the work is in the public domain, you are free to arrange it however you’d like. This means that you may create custom vocal and/or instrumental arrangements of pieces that are within the CCLI database without requesting permission from the copyright holder or paying for a separate license, as long as no published version is already available. For more information, see The Church Musician’s Guide to Copyright and Licenses. There are two basic ways to use handbells or chimes in an anthem: ringing certain bells at the same time to create blocked chords or ringing the bells separately to create melodies. For this age, I recommend using blocked chords. This can be as simple as using the harmonies found in the accompaniment, often one chord for every 1-2 measures. Depending on the piece, you may be able to ring a cluster chord that fits with more than one chord in the accompaniment, so you can ring the same chord over and over while the accompaniment changes underneath. Try ringing simple melodic patterns during the instrumental sections of the piece (so they can still sing with the group). I recommend writing something simple in quarter-note or half-note beats (not too fast) and giving one bell to each person. Create a simple 4-5 note pattern made up of chord tones that match the harmony. Allen Pote’s anthem “On the Third Day” is an example of an anthem that uses bells in this way. Once you’ve identified an instrument that will complement the style and tone of the anthem, look for places in the piece where you want to add a part. The introduction and interludes are natural choices, but you might also consider have the instrumental part overlap with the choir line toward the end of the piece (like a descant). If you’re not familiar with this particular instrument, look up the range and description of tone so you can write something that fits well and feels natural to play. If you’re writing for a harmonic instrument (guitar, ukulele), analyze the piano accompaniment and write in the chord symbols for the instrumentalist to play from. If you’re writing for a melodic instrument (trumpet, flute, oboe, violin), consider descants and countermelodies that would complement what’s already on the page. Try singing the instrumental line as you play the accompaniment so you can get an idea of how the parts will fit together. Even something simple like outlining chord tones can be an effective way to add color and melodic interest. Look for places where the motion in the piano accompaniment slows down and write something more active in the instrumental part (and vice versa). This will create the feeling of a musical conversation. Everything you write doesn’t have to be original; look through the piece and pull out a few interesting melodic excerpts, either from the accompaniment or from the choral part and reuse them. Listen to a few examples of anthems that include an instrumental part to get some ideas for what works well. For instance, here are 58 children’s anthems with instrumental parts. Looking for some rhythmic inspiration? 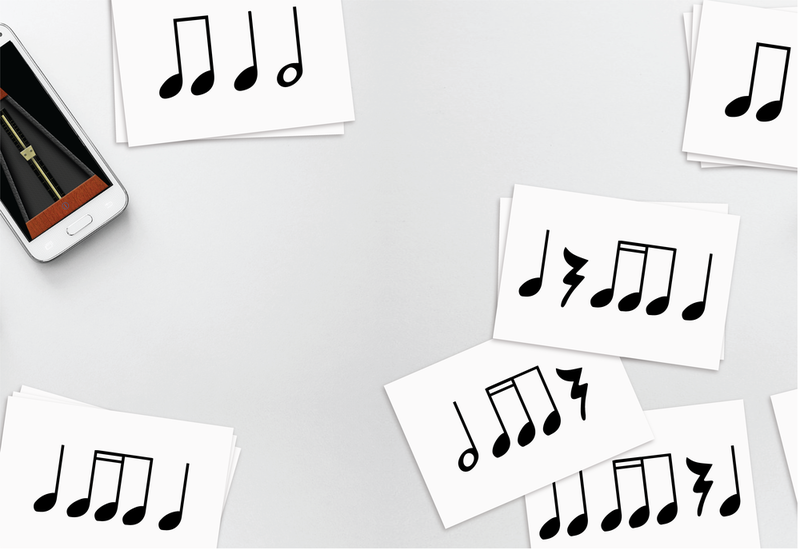 This printable collection includes six rhythm pattern card sets with a total of 192 different patterns made up of quarter notes, half notes, eighth notes, sixteenth notes, and quarter rests in duple and triple meters (32 cards/set). Once you’ve selected one or more percussion or Orff instruments, look for sections of the piece where you want to add in a new part. Percussion instruments are great for creating an ostinato pattern, so consider writing a series of repeated patterns (tonal or rhythm, depending on the instruments you’re using) to enhance the accompaniment in certain spots. Something that supports the harmony - the roots of the chords or outlining chord tones - often works well. Add interest with a unique rhythm pattern. Boomwhackers also work well! Here’s a quick guide for using Boomwhackers with your choir. If you’re working with a children’s choir and you have a few of your choir members playing these instruments, consider writing a part for them during the instrumental sections of the piece so that they can still sing with the group. If you have the resources, consider using a few different instruments and given each child a slightly different part to play. Have them come in at different points in the piece, adding new layers and creating a richer texture. Introducing instruments to your choir for the first time? See this post: Sing & Play: How to Use Instruments with Your Children’s Choir. Movement is a natural response to music, for people of all ages. Adding a hand-clapping sequence is a great way to incorporate movement and something percussive into your choir anthems, especially for children and youth. Choose a place in the anthem where you want to add in hand-clapping. Identify the meter and the length of the section (I recommend at least 4-8 measures). Look at the rhythm of the accompaniment during these measures and think about a few different rhythm patterns you could incorporate that would provide some contrast. Cindy Berry’s anthem, “Christmas is Here, Sing Noel” is an example of an anthem that incorporates a short hand-clapping sequence. A B A B or A B A C.
As I mentioned before, these patterns don’t have to be completely novel; look through the anthem and pull out some interesting rhythms that you can reuse as a hand-clapping rhythm in this particular spot. This will make the added part feel more natural and help reinforce your choir’s understanding of the piece as a whole. Jot down your ideas and practice singing the choir part, doing the hand-clapping sequence during the interlude, and coming back in on time. Make sure they have enough time to think about taking a good breath before they sing again and that it doesn’t feel too rushed in the final measure before an entrance. I recommend adding new rhythmic or melodic lines primarily to the instrumental sections of the piece. Try to avoid adding a new part on top of the vocal parts, unless it’s very light and simple and won’t be too overpowering or distracting. Repetition is a good thing, so don’t be afraid of writing a few basic patterns and repeating them. You can always vary the part later by changing the octave, dynamic level, or rhythm patterns (while keeping the melodic pitches the same). Have you ever created your own instrumental part to go with an anthem? How did you go about it?